I’ve been craving an awesome hot fudge sundae for months. MONTHS, I tell you. And for various reasons said hot fudge sundae has been continually postponed: too full, too late, too busy. Well, I want to tell you about an ridiculous hot fudge sundae that I just had at Ample Hills Creamery in Brooklyn that’s worth penciling into your calendar stat. I’m a huge fan of the ice cream at Ample Hills (and so is Blondie). Such a fan that while it makes me sad to spot amazing specials on Twitter and Facebook, knowing that I won’t make it in time for one day dealies—like when they were delivering pints during the blizzard. Yet, in my heart of hearts I know that if I lived any closer I’d probably pack on some serious pounds as a frequent buyer. And…absence makes the heart grow fonder, plus gives me a great excuse to really splurge on the special trips that I do get to make to AH. Lawman had long promised me that hot fudge sundae and I finally went to collect after our book signing at the Downtown Literary Festival. I was just going to do their typical brownie sundae when a new (or at least new-to-me) item on their menu caught my attention: the “Crossing Brooklyn Ferry,” a tribute to the poem from which Ample Hills derives its name. Crossing Brooklyn Ferry ($10.65 plus tax) is an epic hybrid of a banana split and a hot fudge sundae. It starts in a little teal boat, yes, a boat. They line the sides of the boat with a split banana then fill the hull with your choice of ooey-gooey cake or brownie then topped with three huge scoops of ice cream THEN…still with me?...topped with homemade hot fudge and caramel, wet walnuts, fresh whipped cream, sprinkles and a cherry on top. Right now, for a limited time, they are serving chocolate ooey-goey cake and when I placed my order it came highly recommended by several of the staff, so I picked that as my base. For the ice creams I went with strawberries and cream, peanut butter flake and Honey Graham (a honey vanilla ice cream with pieces of homemade chocolate-covered graham cracker crust). Since I can’t have walnuts I got those on the side for my fellow sundae eaters, Lawman and Little B. 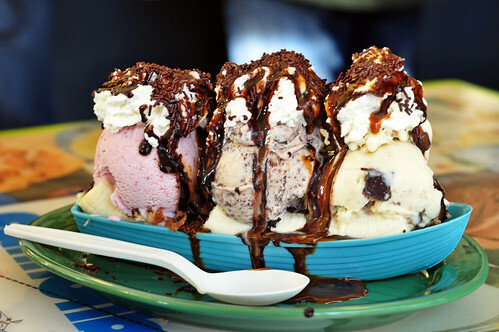 Unless you have a monster appetite, do not undertake consuming this sundae lightly or without aid. In fact, I was politely cautioned by a couple staffers as I placed my order who asked me how many people I had to eat the sundae with me. But if you have back up, oh man, oh man, go for it. Every single darn component of this sundae from the ripe but not too ripe bananas to the gooey cake to the flavor packed ice cream and sauces and whipped cream was top notch. I may not indulge in sundaes often, but next time I do, you can bet it will be another one of these. Wow. I don't care if I get diabetes from eating this. I need it asap!